Spotlighting along the road at Iron Range National Park resulted in good views of two Marbled Frogmouths. 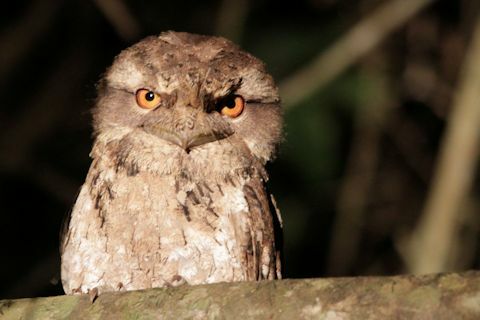 Several more Marbled Frogmouths could be heard calling. Thanks to my tripod and the stillness of the subject, I was able to take this with the zoom lens extended to 400mm illuminated only by a hand-held spotlight. The lens was at maximum aperture (F/5.6) and ISO set to 2000 with the exposure adjusted down 1/3 of a stop to reduce burning out of the highlights. The camera-calculated exposure was 1/6 second.